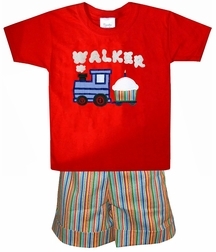 A precious outfit for his birthday party featuring the birthday train pulling a cupcake! We start with red gingham for a John John or longall and make the shoulders fasten with two small striped fabric covered buttons on each shoulder. You may also choose the shorts set which starts with a red cotton shirt. 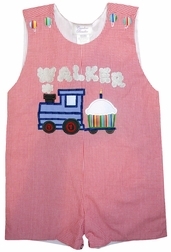 The fronts of the John John, longall and shirt are appliqued with a precious birthday train in royal blue gingham that has black wheels with the number of your child's birthday inside. 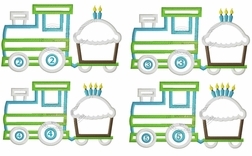 The train is pulling a striped fabric cupcake with white icing and the number of candles to correspond with the birthday number. 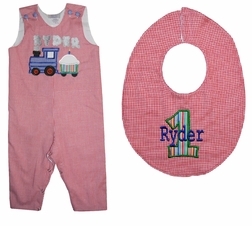 And, make it even more adorable by choosing to have your little one's name coming out of the smoke stack. The shorts, if you choose the 2 piece outfit, are made with the striped fabric and have cuffs at the hem of each leg. Perfect for his 1st through the 5th birthday.